2016 BC Aboriginal Business Award presented by the past Minister of Aboriginal Relations and Reconciliation, John Rustad, to Awardee Tumia Knott and Chief Marilyn Gabriel of Seyem’ Qwantlen Business Group. Celebrate Aboriginal Business in British Columbia at the Ninth Annual Awards Gala Dinner on Thursday, October 26, 2017 at the Fairmont Hotel Vancouver. The BC Aboriginal Business Awards, under the umbrella of the BC Achievement Foundation, are generously supported by New Relationship Trust, TD, Teck, BC Hydro, CN, Encana, MNPLLP, Enbridge and Vancity and are presented in partnership with the Province of British Columbia. 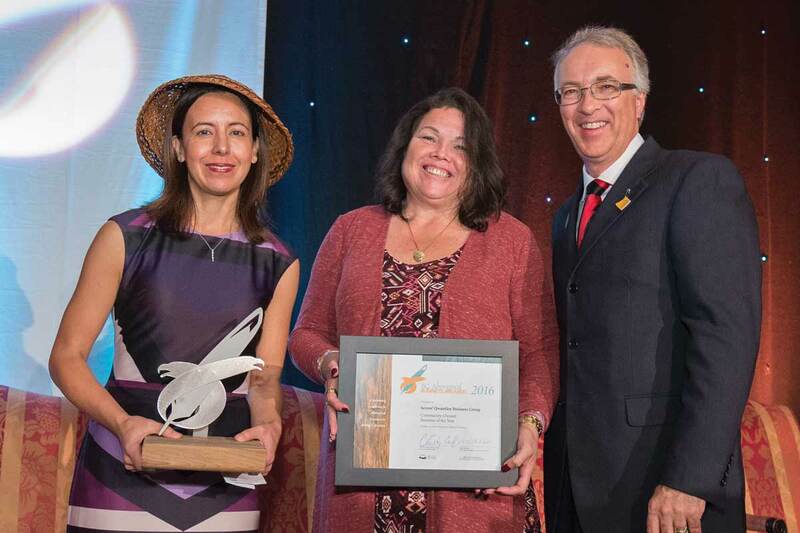 These Awards showcase diverse, vibrant and successful Indigenous businesses in BC while also shining a spotlight on their important and expanding role in the province. The program also provides Awardees with a platform to inspire other Indigenous entrepreneurs to excel by sharing stories of their achievements. The event brings together industry partners and offers opportunities to make connections leading to mutually beneficial collaborations. Since 2008, the inaugural year of the program, 154 Indigenous businesses have been honoured. The unique Individual Achievement Award honouring outstanding Aboriginal business leaders has also been awarded annually since the program’s inception. The 2017 Call for Nominations generated an ever- growing number of nominations in a variety of sectors. These reflected the remarkable and unique industries and entrepreneurial diversity within the Indigenous business community in British Columbia whether it be a young entrepreneur, a small or large business, a community-owned business or a business partnership between Aboriginal partners and the private sector. An independent jury of Indigenous business experts adjudicated the nominations guided by the success and sustainability of the business. Awardees will be honored at a Gala Presentation event. Join the celebration and support Indigenous entrepreneurship at the Gala Presentation Dinner at the Fairmont Hotel Vancouver on October 26 where over 600 guests are expected to attend. Please visit www.bcachievement.com for further details and information on ticket purchase as well as links to past Award Gala Dinner videos and speeches.